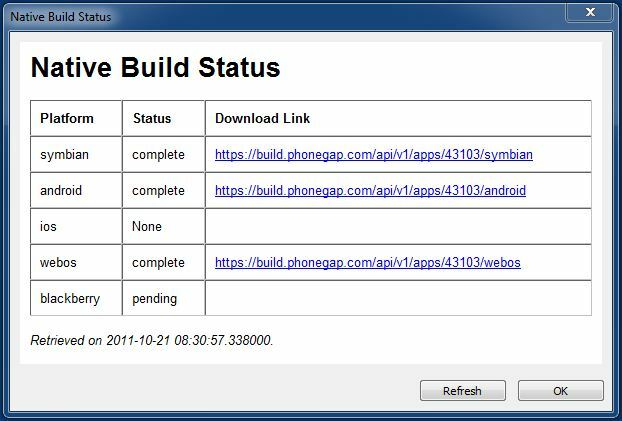 Want a quick way to get an App Studio app compiled with PhoneGap onto your Android device? Use Dropbox! Build your app using PhoneGap as always. Install the Dropbox app on your Android device if you have not done so already. Open Dropbox on the device and click on your .apk file. It will install! PhoneGap have just made a breaking change to their Build process. The result is that splash screens no longer appear on Android devices. Luckily, the fix is easy. The next build will make this the default for all new projects. However, you will need to modify on existing projects. Under the Run menu, there is an option called “Build Native App”. Once you have tested your project, use this option to submit your app to the PhoneGap Build server. The compilers and SDKs to build native apps are large and complex: using a server to perform these operations saves you a lot of grief installing and maintaing them. Once submitted, you can check the status of the build using “Get Native Build Status” under the Run menu. Completed builds have their download links listed. Each user of PhoneGap Build should have their own account. For demo purposes, NS Basic has a default account, but your files will not be secure there. It’s easy to sign up for your own. Once you have it, enter the information into “Deploy Options” under the Tools menu. The program name and your icon will be taken from your project properties. Other PhoneGap options are set up in the configxml property in your project’s properties. Read more about using config.xml here. iOS will not build until Apple’s signing information has been entered. PhoneGap Build is in beta right now. PhoneGap may start charging for this service at a some point. NS Basic/App Studio 1.1.1 Released! NS Basic/App Studio 1.1.1 is ready to download. You can download it from the same URL as before. – Improved support for international languages: check the Arabic sample. – New sample showing how to use PhoneGap to access contacts and camera. – Ability to get the row and column when grid clicked. Controls: Add image map tag to Image control. Controls: Grid now returns row, col on click. Deploy: <Doctype> changed to be HTML5 standard. Deploy: Blank lines in manifest no longer needed. Deploy: Make <body> min-height device aware. Docs: Technote 09 Using PhoneGap API added. Docs: Handbook and Language Reference updated. IDE: Fixed unicode in property values. IDE: Save always saves, regardless of dirty status. IDE: Added prompt for form deletion. IDE: Fixed selection problem in Form Editor. Language: New function GetLocale() added. Language: New function Log10() added. Samples: Tutorial2 and SQLSample2 fixed. Translator: /*…. */ treated as block comment. Translator: a.value=”” Or b.value=”” Or c.value=”” fixed. Translator: DateAdd past end of year fixed. Translator: REM (all by itself) fixed. Translator: x=5: Dim a(x) fixed. NS Basic/App Studio 1.1.0 Released! NS Basic/App Studio 1.10.0 is ready to download. You can download it from the same URL as before. The major new thing in this release is support for PhoneGap. There is a new setting in Project Properties, as well as 2 new Tech Notes. Have fun! PhoneGap API is now supported. IDE: Project explorer icons tweaked. Translator: MsgBox 1 / (1 + 2011 mod 4) fixed. Run “droidgap create”. This will create an Android solution using your NSBasic script files. Compile the application using Ant and deploy to device for testing.